"How many ways did you write women? How many ways did you right women?" From Harriet Tubman to Sandra Bland, Ida B. Wells to Eartha Kitt, Grace Jones to Assata Shakur, A Bound Woman Is a Dangerous Thing is DaMaris B. Hill's "love letter to women who have been denied their humanity." In its most obvious sense, these women are bound in a very real, tangible way: those shackled by the chains of slavery, or imprisoned in jail (often, as we'll see, for defending themselves against physical abuse and sexual assault). But to be bound can also be a positive thing, an expression of love: to be bound to one's ancestors, connected to one's friends and family, accountable to one's community. Here, Hill celebrates women who have been bound in both respects, sometimes simultaneously. Poetry is a deeply personal and intimate form of communion, and it's pretty hit-or-miss for me. I know what I like, even if I have no idea why I like it. And, sadly, as much as I was looking forward to A Bound Woman Is a Dangerous Thing (I mean, THAT COVER! ), most of the poems just didn't do it for me. First, the pros: Hill introduced me to a number of badass women I'd never heard of before, and whom I'd love to learn more about. I love the concept of the collection, and the way it's laid out, with photos, biographies, and poems inspired by the subjects. But the cons: I just had a ton of trouble getting into the poems themselves. Likewise, the short biographies of the women featured often seem incomplete, and are sometimes downright confusing. The most obvious example to come to mind is Joan Little, who is listed as born in 1953 with an "unknown" date of death. Wikipedia lists her as still alive, so...that's weird. At the very least, it requires further explanation, right? Poetry is hardly in my wheelhouse, though, and judging from the other reviews, I'm in the minority here, so don't let my experiences dissuade you. Roxane Gay blurbed it, so. 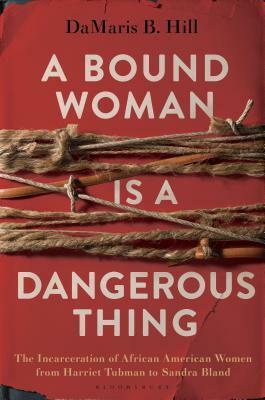 Sign into Goodreads to see if any of your friends have read A Bound Woman Is a Dangerous Thing.